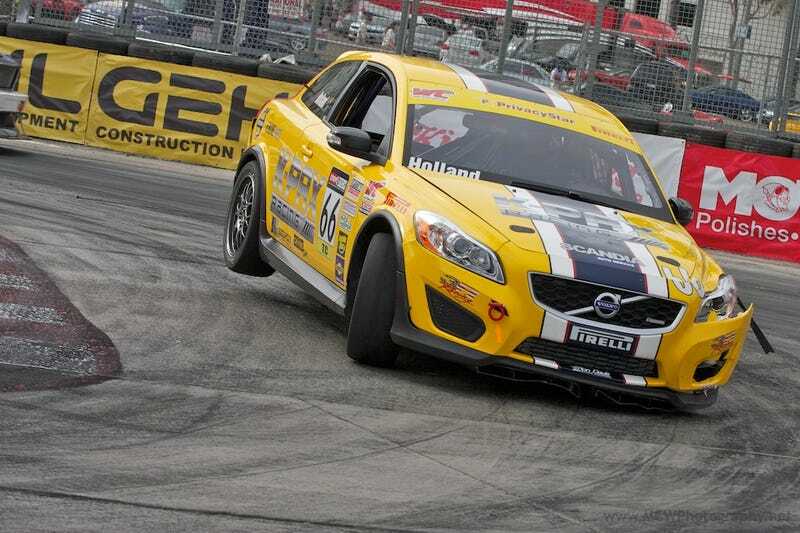 K-PAX Racing's turned an off-the-line Volvo C30 into a world-beating race car in 60 days. Driver Robb Holland's giving us weekly race reports on Project Grocery Getter. Race two: Long Beach. —Ed. Had you told me before the start of the weekend that we would walk away with the fastest time in first practice and a podium finish in the race, I'd of taken it in a heartbeat. On the other hand, had you told me that we would qualify toward the back of the field, that my brake system issues from St. Pete would be back in full effect, and that I would be in the tire barriers not once, but twice, during the race, I'd probably have found place nice a quiet place to lay down… like the 405 at quitting time on a Friday, July 3rd. Sigh. Let me back it up to how the weekend began. For sports cars, there is no race like the Long Beach Grand Prix. For starters the race is in the consumer capital of the world, Southern California. I read somewhere that SoCal consumes the equivalent of a third world country every week. Last week it was Detroit. The coolest thing about the LBGP is the fans, all 250,000 of them. From the time the guys unload the cars until the last drop of champagne has been sprayed, the Long Beach fans are everywhere. What makes that a bit challenging for the drivers is, normally we have the refuge of the drivers lounge, located in our trailer, that we can retreat to when we need a few seconds to ourselves before heading out on track. At Long Beach everything is packed in so tight, there isn't enough room for all of the rigs for every series that runs there over the course of the weekend (IRL, Indy Lights, ALMS, World Challenge, Drifting). So only the top few World Challenge teams get to park a rig in the paddock. We were way fortunate that K-PAX was one of those teams that got to bring a rig in but we usually travel with at least two rigs. So with only the one rig allowed in at Long Beach, we had to cram 3 drivers, several engineers, and team management into the 10'x8' Engineering Room in our main trailer. With so many people crammed in one tiny space, it's really not much better then being out in the paddock with all of the crowds. In addition to the crowds, the other thing about Long Beach is that always amazes me is our schedule. Because there are so many series running here, we don't get a huge amount of track time. Two half- hour practice sessions, one 15-minute qualifying session, and then the race. So you would think that with only around two hours of track time over the four days that we're in town, that we would have tons of down time. Nothing could be further from the truth. To start with, both our sessions on Saturday and Sunday started wicked early (7:15 am and 8:25 am respectively). When you take into account that we have a pre-session chat with the engineers and have to be in the cars at pre-grid a half an hour before the track goes hot, you realize you have to be at the track around 6ish to make that work. But on top of that, finding a place to park and actually getting into the track, you quickly figure out that you need to leave the hotel around 5am to make it in time. That in-and-of itself doesn't sound to bad until you also take into account that we were doing two-hour autograph sessions until 10:00 pm the night before practice and attending the launch of the new K-PAX Racing C30 GT Performance Package over at Power Volvo until 9:00 pm the night before Qualifying. In addition to that, we have our post session debriefs with the team engineers, the lunch(es) with all the Volvo execs (OK those were cool. It's amazing how many of the Volvo guys are die hard motorsports fans. Who'd of thunk? ), meetings with sponsors and doing lectures and paddock tours for local underprivileged kids for Judy Strawn and her Racers Who Care group, you begin to see how your days can just totally vanish. It gets so bad sometimes that Holly (Team organizer, travel agent, and Mom) has to literally go round up drivers prior to our on track sessions otherwise we would totally miss them! Seriously. Anyways, once you get past all that stuff, it still comes down to going fast on track, which we did, coming out of the first practice session as the fastest Touring Car! Wow, after all of our struggles during the St. Pete races, I was not expecting that big of a jump in improvement in the car. I've always said, you give K-PAX Racing a couple of days at the shop to play with a car and it's going to come out faster. After St. Pete they had a couple of weeks and boy did they step up to the plate! The C30 was so much easier to drive and far more consistent from corner to corner, which is a characteristic that is really important to me as a driver. With a lot of the corporate guys from Volvo in attendance, it was a really great way to start off the weekend. However, during practice two and qualifying we had some issues creep back up that we thought we had solved and the decision was made that as I was already pretty dialed into the track already, we would use the second practice session and qualifying to try and sort through our gremlins so that the car would be good to go for the race. Unfortunately, that decision meant that I fell to 3rd in the second practice and all the way to 9th in qualifying! The good news was that we finally determined what was causing a majority of our problems. The bad news was, there wasn't a damn thing we could really do about it until after the race when we got back to the shop. Way back in my first post, I went on for a bit about how difficult it was to adapt a street car to go racing. One of the things that I talked about was the fact that the series made a switch this year from the Toyo R888 DOT street compound tire that we had been running for several years as the spec tire, to the Pirelli P Zero Racing Slicks. The difference is massive. We are now putting over 70% more load into the car and are seeing lateral forces increase to almost 1.7g's. That's a huge amount of stress on what is still essentially a street car. One of the places that absorbs a large percentage of that load, is the wheel bearings. Now the stock C30 wheel bearing are holding up to our abuses just great, however with the new slicks putting them under twice the load they were designed for, they are flexing just enough that the hub mounted wheel speed sensor can no longer get a signal from the bearing mounted tone ring. The result? No wheel speeds being transmitted to the ECU. Ok, so you're thinking, "What's the big deal? So you don't know how fast you're going." You're right, "So I don't know how fast I'm going", is no big deal. However, the car doesn't know how fast it's going either, which is a big deal. A really big deal as it turns out. When the car doesn't get wheel speeds there are a whole bunch of things that get totally FUBARed. For example the power steering, ABS, and boost all get a bit cranky when you lose wheel speeds. All of those things you apparently need on the race track. These are some the same issues that we had been experiencing at St. Pete but we had originally put them down to failure of the wheel speed sensors themselves. Turns out that the sensors are just fine but as the bearings flex the distance between the sensor and the tone ring becomes to great and the sensor can no longer get a signal. If the ECU loses touch with them for more than a few milliseconds it decides that they are not working at all and stops trying to communicate. (Just to be clear, these are not circumstances or conditions that you would EVER experience, in even the most extreme driving conditions in a street car). What we came up with, as a stopgap solution, was to put a toggle switch on the line so that we can reset the signal to the ECU, which would allow us to keep racing for a bit before we had to hit the reset switch again. As much as this was going to be a PITA during the race, knowing that we had discovered the root cause to a number of our problems was a big relief. With the knowledge that I was going to experience basically the same issues we faced at St. Pete, the race went pretty much as expected…with a few exceptions. I got a blinder of a start and got past the first two rows in front of me, which put me up to 5th with a solid run on getting 4th by turn one. That plan went right out the window when my teammate, who also got a solid launch off the line, tried to squeeze between the two cars that had started on the front row. The hole that he was going for vanished and in the process, the Volkswagen GLI of Ron Zitza got turned into points leader Lawson Aschenbach taking the top two cars out of the race and giving my teammate a slow leak in his right front tire! Unfortunately Zitza's car rolled to the inside of the front straight directly in my path, so I had to check up and several cars that I had just passed came flying back past me. I put my head down and caught back up to the lead group just coming out of turn 1 and was able to get underneath the Honda of Shea Holbrook going into turns 3 and 4, to regain 4th place. Coming out of turn 6, my teammates tire finally completely deflated causing him to slow and the two cars directly behind to check up. This meant that I was able to catch back up to that group and possibly slot into second place. That was not to be though as an entirely new issue crept up and my brake pedal went straight to the floor as I was heading into turn 8 at 90mph! I was able to pump the brake and get some small bit of braking done right before I went into the tire wall but any chance I had of staying with the leaders was gone. Fortunately, I had hit the thickest part of the tire wall and had no real damage to our Grocery Getter. Good thing I had gotten some practice though, as my brake pedal did the same thing going into the fountain turn with the exact same result! At that point I decided not to try and push to try to reel the leaders back and just try to run consistent laps and bring the car home. In doing so I was able to get past a few of the cars that had gotten around me whilst I was visiting the various tire walls around the circuit and I was able to bring the Grocery Getter home in 3rd place, the first podium finish for Volvo in World Challenge competition. Although it wasn't the way we wanted it to happen, K-PAX Racing and all of the Volvo guys were pumped for such a strong result so early in the cars development. We know we still have some serious work to do, but with the race at Miller Motorsports Park coming up this weekend we don't have a huge amount of time to get everything we want to, done in time. Stay tuned there's plenty more to come. Images courtesy of K-PAX racing/MCWPhotography.